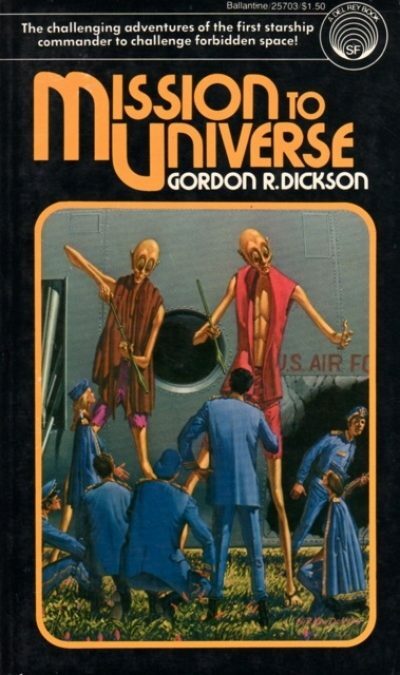 Mission to Universe is a comparatively obscure Gordon R. Dickson novel. I chose it over more famous alternatives like the Dorsai series1 or the Dragon Knight series, both available in many installments. I chose 1965’s Mission to Universe because sentiment. It wasn’t my first Dickson2, but the 1977 edition was in the first stack of Del Rey books I ever bought. In the 1970s I was a huge fan of Del Rey books. I may have chosen poorly…. Four! Billion! People! share an overcrowded Earth. More than fifty nations have armed themselves with nuclear weapons of stupendous power. Nobody wants a nuclear war, but nobody can see a way to safely disarm. All they can do is watch each other nervously while waiting for some crisis to trigger the final war. Benjamin Shore thinks America’s newly developed phase ship, able to bridge interstellar distances in an instant, could be humanity’s salvation. Habitable worlds around other stars could provide a much needed release valve for Earth’s population. Shore’s superiors disagree; they worry that the phase ship could itself be the spark needed to set off World War Three. Following the delivery of covert orders from Washington, Shore hastily assembles a crew and takes the Phase Ship Mark III into deepest space. Once there, he reveals a heavily redacted copy of their orders: to boldly go search the sky until the Phase Ship Mark III finds a new home for humanity! What Shore’s crew cannot know is that Shore’s redactions conceal the truth; the President never ordered the ship into space. The mission is a fraud. The dangers are real enough. Cutting edge is another word for unreliable; some of the life support systems prove wonky. The ship is forced to supplement its food supplies with organics from life-bearing worlds. However, such worlds are both rare and dangerous. Any world with complex life worth harvesting also holds lifeforms dangerous to humans. Shore concludes that the stars of the outer part of the Milky Way are too far apart for an extended search to be practical (travel is instant but the computations needed beforehand are not). Shore takes the Phase Ship Mark III far towards the core of the Milky Way, where the star are close, and Earth-like worlds easier to find. But success brings with it a danger that Shore has overlooked: just as the peripheral worlds had carnivores as well as herbivores, so the core stars have native starfarers, all dangerous in their way. Dangerous and technologically advanced starfarers. Humans were still using fire-hardened sticks when the advanced races were already quarrelling over which of them would rule the inner stars. A hundred thousand years have passed since that great conflict. The ancient enemies still survive. And Shore has led his people into the heart of alien territory. I cannot help but think that Shore has found so few Earth-like worlds in the Sun’s galactic neighbourhood because he starts looking at the larger, named, stars … the ones who have been burning for less time than it took complex life to appear on Earth3. It is only after the voyaging towards the core of the galaxy that Phase Ship Mark III focuses its effort on main sequence sun-like stars. On a similar note, I think the reason Phase Ship Mark III loses such a high fraction of their crew over the course of the mission has less to do with the universe being a dangerous place and more to do with Shore lacking foresight and caution. He is pretty good at working out what has gone wrong. Once it’s too late…. Nobody in the book ever says this, but I found myself wondering if the US government had feared to reveal phase ship technology because it amounts to teleportation. Instant travel from point to point. It would seem that the same tech that powers Phase Ship Mark III would also allow the US to teleport a gigaton bomb into the Kremlin. That is a very destabilizing technology. It is lucky for Earth’s habitants (spoiler) that the eventual revelation of phase technology did not trigger WWIII4. This is a universe that embodies the Fermi Paradox: intelligent life is common and interstellar travel is easy, so why wasn’t the Earth colonized ages ago? Possible answers: 1) nobody really worried about such issues when this novel was written; or 2) Earth is located in a terrible neighbourhood where nobody with a choice would live. The problem with the second explanation is that Earth is filled with places where nobody with a choice would want to settle, places that are nonetheless settled. Sometimes sentient beings don’t actually have a choice. Perhaps only a few 1960s feminists would have noticed this when the book was first published, but it is glaringly obvious now: great leader Shore is a male chauvinist pig (MCP) but he seems to be in the minority. He kvetches that he was forced to head out with a crew partially composed of women. Of course, the women seem to acquit themselves as well as the men in the course of the mission; the narrative does not support Shore’s reservations. I cannot decide if this means that Dickson was a closet feminist, or whether he really believed, like Shore, that women are unsuited to deep space exploration. Dickson was writing under various restrictions. 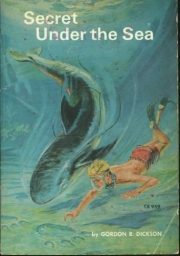 I vaguely remember reading an essay in which Dickson complained that publishers wanted short and simple SF books in the 1960s. They believed that SF readers didn’t want length and complexity (and were soon to be proved wrong). This book is an example of enforced short and simple. Dickson does not have room for much in the way of plot or for complex characters. Humanity faces two dreadful futures … so of course the first species of aliens the explorers meet illustrates one ugly alternative, and the second illustrates the other choice. It’s all very linear. There are peripheral issues (terrestrial politics, crew relationships) but they do not drive the main plot. I don’t know that I could recommend this to modern readers expecting more complex novels, but people curious about Dickson’s lesser works can purchase Mission to Universe here or here. 1: There is a passing mention of the Chantry Guild towards the end of this book, a mention that suggests a connection to the Dorsai universe. And … the phase ship technology seems like the one used in the (already published) Dorsai books. However, other details don’t fit. There are Earth-like worlds in local space in the Dorsai books (granted, around stars Phase Ship Mark III never bothered to check out. ), and the two alien races aren’t mentioned at all. Dickson may have been lifting details from previously published works without much thought to consistency. The acknowledged Dorsai books are not especially consistent with each other so the inconsistencies do not necessarily rule out a link. 2: My first Dickson was Secret Under the Sea. I am fairly sure I first read it in 1969. That means I was reading Dickson well before I encountered authors like Asimov or Heinlein. What about Clarke, you ask? I read Clarke in the 1960s but not his SF. We had a copy of this venerable paperback, part of my father’s collection of books about rockets and space travel. 3: For some reason, the 1965 Dickson thought that the Milky Way had about a thousand times more stars than it actually does (hundreds of trillions rather than hundreds of billions). This could be because Science Marched On, but I suspect that Dickson just got his numbers wrong. Not the only evidence of hurry in the book. 4: I can think of two explanations for this odd refusal to engage in nuclear holocaust: 1) the US proclaimed that it had the drop on everyone else and cowed other nations into submission or 2) for some inexplicable reason humans preferred not to die in such a holocaust. Hard to imagine, isn’t it?